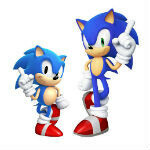 Believe it or not, Sonic The Hedgehog is celebrating his 23rd birthday (how old does that make you feel?) and to mark the occasion, SEGA has decided to give us all the gift of discounted games. Well, almost all of us. All Sonic games on Android and iOS have been marked down to just 99 cents; unfortunately, Sonic games for Windows Phone are still full price. Sonic Dash also isn't in the deal, because that game is free anyway. If you want to get in on the other games, just choose which one you want, and the platform you want it on, and get your deal on! I'm about to be a year older than Sonic in a couple of days... Anyway, as usual, no Windows Phone. Did u even read the article? WP does have all the Sonic games, except that they're still full price. Dude of course I know WP has Sonic games, I'm talking about games and how they are always exempt from these multi-platform specials. It makes me feel old that I'm old than Sonic the Hedgehog.